From the first men through this way? F. Scott Fitzgerald in This Side of Paradise called summer “only the unfulfilled promise of spring…a sad season of life without growth”, but, like a bolt from the blue, one stolen plane and one young man’s life changed all of that. On August 10th, 2018, underneath an auspicious clear sky a young man by the name of Rich Russell, Beebo to friends and family, took to the air in a stolen Bombardier and carried with him the shattered hopes and failed dreams of a million silent white men. There was something magical about that weekend in the way people connected with that perplexing event, and though nearly two months have passed now since that day, the feelings are still as raw and real as they were the day the Skyking took to the air and made his final plunge into Keton Island, burning brightly for one final time. We truly believed we had witnessed the last flight of the white man. America loves its folk heroes, but in the glitz and glam that are glommed on by the separated millions of a fractured nation, there aren’t many to look to anymore. Where folk heroes like Johnny Appleseed once manifested America as an unspoiled promised land, now the folk heroes of the 21st century are men like the Killdozer who manifested the simmering violence of a nation that is triggered by endless indignities of a perpetually petty bureaucracy. Remove the Killdozer tank though and he’s a man with many grudges. We can sympathize, but we can’t empathize. Maybe some can, but the situation is too absurd. It’s a good folk tale, but it doesn’t speak to the human condition. Rich, for one moment, seemed to be relegated to that role of an American curiosity, but as the details of that fateful flight leaked out his spirit drew millions to be near to him. Rich was special. Rich was different. Rich became a martyr. And every real white man of my generation understood that immediately. Psychopaths with fancy pieces of paper will scoff at every word I write about this, but that’s fine. It’s not for them I write and they aren’t my people anyway. They even barely qualify as such. They’re social climbers for widely discredited institutions. At best they can only imagine the little lives in little houses from the top of their crumbling little summits. If you’re still with me this far, you either already know what I’m going to say or you’re eager to actually understand. The Snark Set likes to sneer at notions of whiteness when they know full well what it is; if the admissions office of the University of Michigan and every Human Resources rep in this country know what whiteness is, then you with your $100k ticket to perpetual box wine parties and SSRI-stares with your cat certainly know what it is. This is not open to discussion. This isn’t about parrying the disingenuous and bad faith rhetorical gotcha-questions, however. To understand what truly happened to cause so many total strangers to connect with the curious event of the Sea-Tac airport you have to first admit there is whiteness. You then have to admit there’s a lot of trouble and tension going on with it. And Rich embodied it and carried it on with him. There’s something genetic, cultural, and spiritual that drove men like Rich’s ancestors to go “yes, I’ll climb into this God-forsaken man-made vessel and launch myself to the unknown ends of the earth at risk of life and limb”. They traipsed the world for God, king, country, and family, for the spoils of war and the bounties of the earth no matter what it took to get to them and no matter who they needed to kill to have them. And in that great capacity for both evil and good, an awe-inspiring world was made. A world we are privileged in our whiteness to watch fall apart before our very eyes, like the farmers outside the city of Rome watching barbarian soldiers trample the crops and powerless to stop the ruin ahead. There really is madness and melancholy in our way of being. 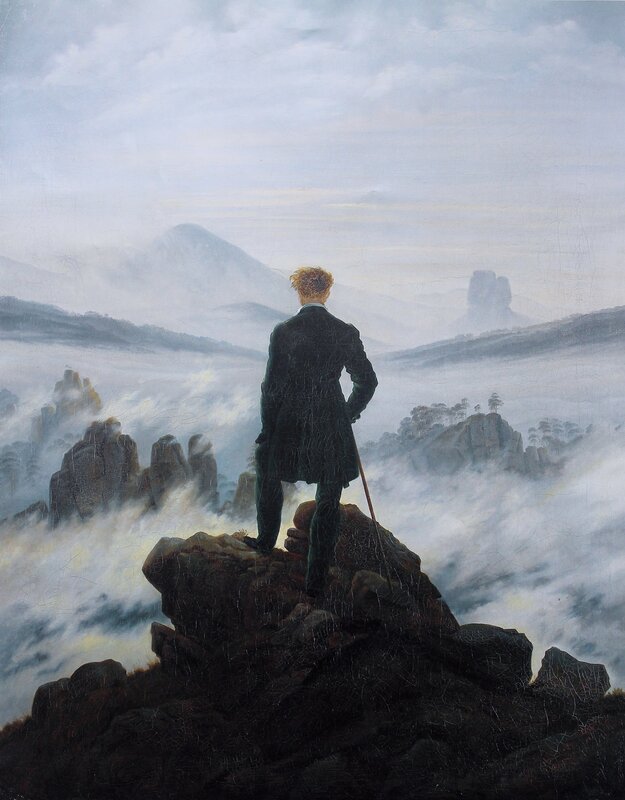 Nowadays the Wanderer Above the Sea of Fog by Caspar Friedrich feels like a clarion call to us, we feel an intense sense of longing in the painting, but it was created by a depressive who was largely forgotten by his death. His resurgence only came later. We all know this is the fate that awaits us, with immortality feeling so impossible to achieve. Our ancestors could channel that madness and throw themselves at the wilderness and the wild tribes of the earth, but what is left for us to explore? Born too late to explore the earth, born too soon to go to the stars, but born just in time to wonder how the hell we feel so lost, sad, and angry in such a bountiful society. I paint a picture that makes it sound like every white man has in it him to be one of the Great Men history, but there are actually few white men who can be that and fewer still who strive to be Great Men, even if the spark is there. For most what remains is either their children or what Stan Rogers called “a lonely cairn of stones”. Those who haven’t been utterly degenerated and degraded by a world that straight-faced intellectuals seriously try and explain is now a better place are almost always very humble people. What they want is simple. Home and hearth. Wife and child. This is not a future for many of them now. Rich, it will be noted, was married. To what his own chaos was, I cannot attest. The devil here is not in the details as the results remain the same. It’s simply important to note that often times these simple desires aren’t enough to save white men like the Skyking. What he must’ve seen through that windshield in the light of the dying day may have been some reflection of a better life. All the mental health services in the world would have never saved him. I predicted at the time in a tweet thread that in light of his death people will likely try to speak about mental illness without even really speaking about it. Just another fundraising drive for people who peddle pharmaceutical panaceas without the wisdom to apply the medicine in anything approaching responsibility. I then made a prediction that they will probably just ignore it because Rich was claimed by the undesirables. I was correct on the latter. He could’ve been on pills that would balloon up his weight and maybe kept him on a steady simulacrum of normality at best. Or he could’ve ended up another OD in the crisis the media doesn’t really talk about in proportion to the amount of people it’s affecting, strangely enough. It’s okay though, the company that pumped the poisonous rot into white communities have just the cure. Truth is, the game was rigged from the start. Rich had a glimpse of that. He was afforded the clear-eyed lucidity that is granted to holy fools. In fact it seems almost like divine providence that we even got the tapes, but it’s likely they would have gotten out one way or the other. Had we not heard him in his own words, unedited and unabridged, we would have ever grieved for him. We’ve had men crash planes for foolish reasons, he could’ve been just another Sunday story. But when people heard those words, he became in those moments a generation’s howling anguish. Rich may not have had a full understanding of what he was going through and would have likely denied it. He didn’t want to hurt anyone. He didn’t want to trouble anyone. He didn’t want to be a problem. Why would anyone think like that? Why do thousands say they understand it too? That’s the prison white men find themselves in. The problem with no name that cannot be named. Your choices end up being that you either grit your teeth or you check out completely and terminally. Jordan Peterson has been an inspiration for many men seeking clean and orderly domiciles and the maintenance of pristine phalluses, but Peterson would have failed him too. Just like every instance where he’s dumbstruck by simple questions that challenge his house-of-cards liberalism or just outright refuses to answer the questions he knows the answers to, there’s nothing of value he could have told Rich that would have saved his life because Rich embodied the deep-seated damage of a whole generation of white men. If Peterson could have even said anything, Rich would have probably just smiled, thanked Mr. Peterson, and walked away unhelped. Difficult questions require difficult answers, none of which the gatekeepers of polite society can ever offer for the sake of their own social standings and salary. There was never a future for someone like Rich, absorbing messaging that he was slated for planned obsolescence in the fake and gay Superior Future. His own words show how aware he was of this on that gut level. He described his own job as “I lift a lot of bags. Like a lot of bags. So many bags.” The kind of job that will eventually go to a fat bisexual Latinx with a degree in Queer Latin-American Studies, before they too are peacefully sunset by a robot gayer than them. Whether or not he knew he was opting himself out of a raw deal, we knew immediately. And so we all lost our minds a little bit that day. We all remembered we were just guys with a couple of screws loose. What touched so many people was the sincerity in Rich’s voice. Listen to his voice and you know the kind of guy he was, one would always be out of step with the New Normal. I have my own criticism of my fellow millennials, but a lot of what was said about them is and was always so absurd that it doesn’t even merit refutation. Guys like Rich fell behind and will continue to fall behind. If you want to trust a plan, that’s the plan you can trust to happen. Just look to the conditions. Twitter is an amazing place in it reflects the collective Ids of the diverse groups that populate it. It is here you will find no end to the genocidal intent that inevitably emerges when people are neighbors and aren’t really certain why. And with every issue that plagues white folks becomes more and more apparent, the cheering of their demise gets louder and louder. The conditions that are tearing through people of my generation, from the economics to the narcotics paint a dark picture of the future, made grislier by the hooting and hollering that accompanies it. All of this has been bottled up in our collective unconsciousness for too long. And before this the bursts of rage were reprehensible murders. Snarky reactions don’t make it any less true. Man is driven towards religion and faith because of our ultimate smallness in the great and grand scheme of things. Deprive them, they’ll find it elsewhere. Rich embodied the Everyman quality many feel and thus he became an unknowing vessel for people’s own failed hopes and dreams. They sailed off into that evening sky, doing one last barrel roll of defiance just to see if it could be done at all. It’s not for nothing that more and more look to non-fiction in their entertainment as the fiction produced now less and less resembles their lives. Fiction can be about anything you want it to be, but at the end of the day for it to be real at all it has to be real to our lives. So now deprived of the true feeling of religious expression, his first God, and now deprived of stories to be inspired by and to aspire to, his second god, the white man has no catharsis. There is no purging of the deep turmoil of his soul. He is trapped inside of a night that has no end. Hence Rich as a vessel and martyr. People looked to him and saw the guy who was failed by society, but unlike the exploding evil that pops off every couple of months, he never wanted to hurt anyone. He was the guy who can’t even be allowed to go along to get alone as it isn’t even enough anymore. A guy that the people in power just want to see move more quickly to the exit sign. A guy like us, like our brother or the friend they couldn’t save. A guy who just wanted to see a baby orca. I’m an older millennial. For me, Rich was like one of my own little brothers. And this time I couldn’t save my little brother. For many of you though, Rich was your older brother, and though he’s gone you still want to do him proud. White men, sons and fathers, may have taken their last flight, but you’re still here, alone and fighting. So clench those teeth, dry those tears, and make your older brother proud. The last white men took off that fateful day on August 10th, 2018. This was 100 years to the day that it became clear that the Germans would lose the Battle of Amiens, and thus lose the Great War, setting in motion the historical forces that would lead to everywhere we are and the condition we are now in. History is made in the great moments but it is lived through the smaller, more painful ones. Rich carried all of that fear, anxiety, pain, and dread with him and he crashed it right into a sparsely populated island, hurting no one else and killing only himself. He even apologized to the people who had to clean up the mess he left behind in his death. I can’t think of anything nobler than that. I can’t think of anything whiter than that. The last white man died that day in the last frontier of the continental United States, charting a course to the end and guided by the same crazy determination that drove his forefathers into that land. And in that wreckage, burning through what remains of the last white man, a beloved hero and a make-shift saint, the flames are rising higher and higher. They never stopped burning, however. They were never extinguished. Time has stopped in this moment and the world watches with bated breath to see if a phoenix will emerge from what remains or if the rains of history will douse the flame and scatter the ashes away inside of a gentle wind. For me, the biggest confirmation that Skyking meant something like this was when it was completely ignored within a few hours by all mainstream media outlets.